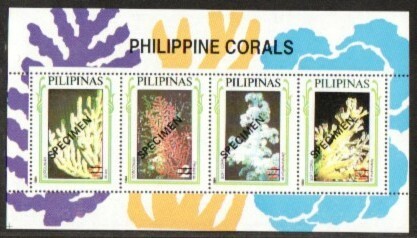 SPECIMEN stamps were issued from 1978 to the present primarily for the purpose of publicizing new issues of the Republic of the Philippines. TYPE I - Original "SPECIMEN": "SPECIMEN" printed, in black, 22 mm. long and 2mm. high; slanted diagonally, reading up. TYPE Ia - same as Type I, except "SPECIMEN" is 25mm. long. TYPE Ib - same as Type I, except "SPECIMEN" is only 14mm. long and 1 1/2 mm. high (in straight line). TYPE II - Questa large "SPECIMEN": only the word "SPECIMEN" printed, in black, 31 mm. long and 3 mm. high; slanted diagonally, reading up for 1978-1979 issues, and in horizontal straight line for later issues (used for the topical sets printed by the House of Questa). TYPE III - Large "SPECIMEN" printed, in black, 19 mm. long and 2 1/2 mm. high; slanted diagonally, reading up except for the 1983 Dental issue which is reading down; a few, like the 60s and 1.20p People Power of 1986, ASEAN Summit of 1987 and Masons of 1987 are in horizontal straight line; with values crossed out by two deleting bars, and with black control numbers (some stamps have the "SPECIMEN" and/or control numbers in different colors; such variations are noted after the Type in the catalogue listings). TYPE IV - Small "SPECIMEN": printed, in black, 16 mm. long and 2 mm. high; slanted diagonally, reading up except for the 1988 Zip Codes issue which are reading down; with values crossed out by two deleting bars, and with black control numbers (some stamps have the "SPECIMEN" and/or control numbers in different colors, such variations are noted after the type in the catalogue listings). TYPE V - Large handstamp "SPECIMEN": in violet, 18 1/2 mm. long and 3 mm. high; with values crossed out by two violet deleting bars; the "SPECIMEN" and deleting bars were applied haphazardly in various styles in different positions; the "SPECIMEN" are mostly slanted, reading down, but there are some that are vertical, reading down, like the Juan Sumulong and Vicente Lim definitive issues. On the Saint Teresa stamps, they are reading up, with some in horizontal straight line. In fact, a few stamps exist with two different types of placement of the word "SPECIMEN"; with red control numbers (only the Concert at the Park "SPECIMEN" has black control numbers). TYPE VI - Small handstamp "SPECIMEN": in violet, 17 1/2 mm. long and 2 mm. high; slanted diagonally, reading down; with values crossed out by two violet deleting bars; with red control numbers (only 3 stamps known with this type). TYPE VII - Questa Small "SPECIMEN": printed, in black, 20 mm. long and 3 mm. high; in horizontal straight line (used only for the 1984 Parrots and L.A. Olympics issues; plus the Espana '84 unofficial "SPECIMENS"). TYPE VIII - Amstar Small "SPECIMEN": printed, in black, with different types of letters, 16 mm. long and 2 mm. high; slanted, reading up; with values crossed out by two deleting bars and with red control numbers of different type (used only for the Vinzons definitive issue). TYPE IX - Extra Large "SPECIMEN": printed, in red, 23 1/2 mm. and 3 mm. high; almost in straight line, with values crossed out by two deleting bars, and with gold control numbers (used only for the Solar Eclipse stamps). TYPE X - Staderini "SPECIMEN": printed, in red, 19 mm. long and 2 1/2 mm. high; in straight line (used only for the 1981 Pope John Paul II issue).